Segment Start with Shivaay comes to Temple with Tia to take Blessings Because His and Tia’s Marriage has been Fixed and They come to Temple Together. There Anika also come to Temple with her Would be Husband Nikhil is with her. Shivaay comes in front of Anika and She Bens Down to take something and They have Hit and Miss Moments. After that Shivaay’s Body Guard Make Way for Him So That he doesn’t have to Wait in Queue Because He is Shivaay Singh Oberoi. 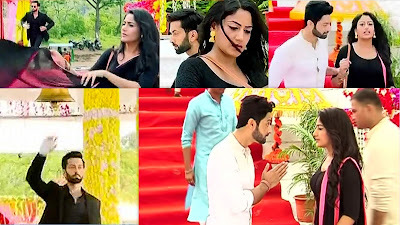 Shivaay comes inside the Temple Rings the bell and Folds his Hand Closes His Eyes and Prays to God Anika Who is Going Inside Stops By His Body Guard Anika Asks Him Why Is She Not Allow to Go Inside. Body Guard Informs her that Shivaay Singh Oberoi is Doing Pooja that’s why Anika gets Furious and about to Go Inside But Her to be Husband Nikhil comes and Stops her. He tells her that he is Big Shot Tycoon and we don’t want to Fight with Him we came here to take Blessing he Folds his hand in front of her to Stop her and She Gets Agree. There will be so Many Hit and Miss Between Anika and Shivaay and they won’t able to Meet with Each other as per New Story Line “What if Same Place,Same Time they don’t See Each other Like Last Time Will they Meet “ So Here In New Story Anika and Shivaay have Hit and Miss Moment at Temple and They won’t See Each other.